"Compass" redirects here. For the mechanic that orients the player, see radar. The following article or section is in need of assistance from someone who plays Pikmin 2. Particularly: Does the needle actually point to the North? (Use the radar.) It might be neat having that information either way. The Director of Destiny (運命ディレクター?, lit. : "Destiny Director") is a treasure in Pikmin 2, and is actually a compass. The glass covering it is shattered, and the needle is stuck in a single position. It is found on sublevel 3 of the Glutton's Kitchen, usually in an alcove. There are Breadbugs, Anode Beetles, a Puffy Blowhog, and many other electrical hazards and enemies on this sublevel that may pose a threat. “With the help of my Pikmin, I've been able to widen the radius of my salvage search. The new areas that have opened up to exploration are far more dangerous. Just to be safe, I'd better review Pikmin traits and characteristics. Press / to dismiss your Pikmin and separate them into color groups. Press / to pick up and hold Pikmin. The Director of Destiny being analyzed. 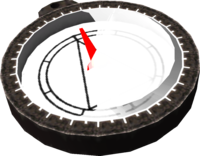 A compass with unshattered casing from the real world. German Schicksalswegweiser Written "Schicksals-wegweiser" in-game. This page was last edited on December 12, 2018, at 10:47.